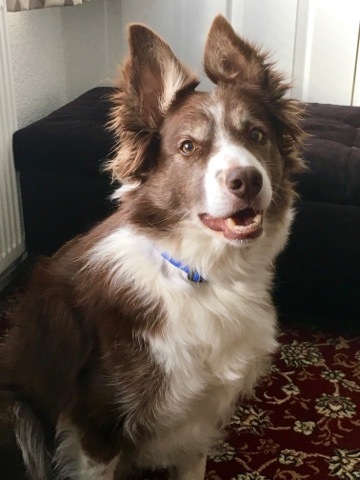 If your dog’s in their twilight years and you’ve noticed they’re less energetic, Milo’s story is definitely worth a read! He’s always been an enthusiastic energetic dog, but for several months now he’s had problems with his back legs. Jaci Jones was amazed at the difference she saw in him after purchasing a Canine Magnetix collar at Crufts 2019. “After his daily walk he’s been going straight into his bed and only getting up, with difficulty, for a drink, and he’s spent most of the day in bed. I could tell by his eyes and the way he walked that he was in pain. I bought him the Canine Magnetix collar recently at Crufts and I’m totally amazed at the difference it has already made. I expected it to be a few weeks before I saw any improvement in him, but it was almost instantly. He’s now back to wanting to play and mooch around outside, which he hasn’t done for a long time. It’s remarkable what the collar has done for my boy. Do you have a dog similar to Milo and you’d like to know more about the Canine Magnetix collars? Click here. For more information or advice, please feel free to contact us at info@magnetixtherapy.com or call 01270 584 564. Please note magnetic therapy is a complementary therapy. If you’re concerned about your dog, please consult a vet first. This entry was posted in Senior Dog, Low Energy. Bookmark the permalink.